City hall weddings are trending nationwide, and for really great reasons. New York City Hall weddings allow you to get married in one of the most beautiful historic buildings of the city, with just your beloved or a few close friends. You get the flexibility to either plan a traditional reception, or skip it completely and have a luxurious dinner for just the two of you – the kind of dinner that would be impossible if you had hundreds of guests. Wear a traditional wedding gown, or an easier shorter dress. Choose a beautiful bouquet, without paying for dozens of centerpieces. Have a gorgeous backdrop for your ceremony photos – without paying tens of thousands to rent a venue. New York City Hall weddings are a long-standing tradition, and I love getting to photograph them. One of my favorite aspects is that the focus is on the marriage itself – the legal and ceremonial joining of two individuals to form a new legal and spiritual entity. It bears the joy and officiousness due to such a major life commitment. Instead of flitting from guest to guest with pleasantries. Instead of managing vendors and timelines and in-laws… the couple gets to focus on one another. It allows them to get married on a weekday if they want to – no coordinating around other people’s flight schedules. In other words, it gives couples much more control over the most important day of their lives. I love the pure joy in this photo. 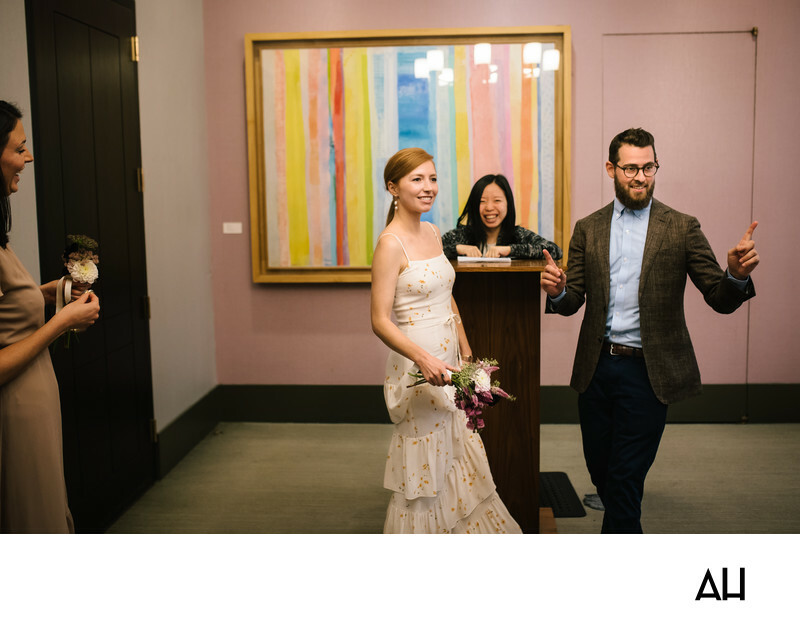 And whenever I photograph city hall weddings, I love that the focus is entirely on the couple’s joy. If you’re concerned about whether a court house event will give you enough mementos, know that you will have amazing photos that document each moment of the ceremony and celebration – photos that commemorate the most special event of your lives. Check out the full guide to a New York City Hall wedding.